Philips The One (7304) hands on review | What Hi-Fi? The perfect blend of performance, features and price? Let’s start with the name. Philips has decided its new LCD model is so important and so uniquely well positioned that it needs a name rather than a number, calling it ‘The One’. Even if we ignore the fact that one is a number, The One is also referred to in the company’s press materials by the product number 7304. It's a hit and a miss on the naming front, then, but almost everything else about The One seems pretty on point, based on the information provided so far and a brief hands-on at the launch event. For starters, it’s a rare delight just to see a TV manufacturer putting some genuine effort into its mid-range models. While most rivals seemingly begrudgingly launch mid-range sets while focusing all of their attention on the flagship models, Philips is heavily pushing The One on its mainstream credentials. Those credentials begin with The One’s size options, of which there are many, including a couple frequently ignored by other manufacturers. 43in, 50in, 55in, 58in, 65in or 70in – the choice is yours. While The One’s price is yet to be revealed, its predecessor, the 7303, launched at under £600 for a 43in model and at about £700 for 50in, so the price for the new model is likely to be reasonable. Despite that price, The One boasts some very tasty specs: three-sided Ambilight, a direct LED backlight, 4K, HDR10+, Dolby Vision and Dolby Atmos. Orchestrating matters is the first-generation version of Philips’ P5 processor, introduced in 2017 with the 55POS9002 OLED. It's of course a shame that it doesn't get a more recent processor (the new OLED805/854 has the third-generation P5), but it's entirely understandable for a more affordable set. And The One will ship with Android TV 9.0 on board, which brings with it Google Assistant. The One is also ‘Works with Alexa’ certified, and either smart assistant can be activated using a button on the remote or a separate smart speaker such as the Google Home or Amazon Echo. 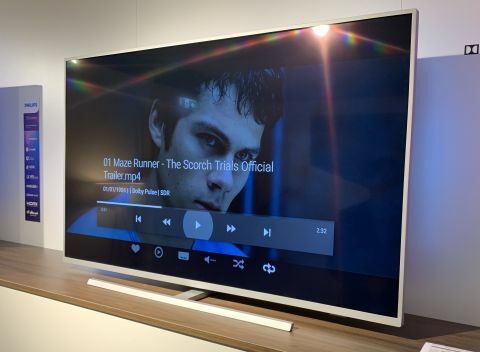 There’s no mention of HDMI 2.1 in relation to any of Philips’ 2019 TVs, which means it is likely to stick with HDMI 2.0, but could also mean that it isn’t yet sure whether its models will be certified by launch. Neither have specific apps been discussed, which we’re assuming means Philips is relying once again on the selection offered by Android TV. In some ways that's fine, but last year it resulted in Philips TVs lacking ITV Hub, All 4 and My5, and it would be a shame to see those omissions repeated. The One is a smart-looking TV. The combination of a light finish to the metal and thick bezels makes it look less sophisticated than many rivals, but there’s also something quite agreeable about the lighter, friendlier design, which should blend nicely in most rooms with light-coloured walls. The angular pedestal looks rather smart and features a swivel function, which should help make up for any viewing-angle deficiencies incurred by the use of an LED backlight. The demonstration of The One at the launch event was brief, but still enough to get us excited for the performance it appears to offer for the price. Next to the outgoing 7303, which it will replace, The One looks sharper, with crisper edge definition and improved overall solidity. At first glance it also looks more detailed, although it could be that the extra definition increases the perception of detail, rather than the panel actually digging up more detail than the old model. Of course, you could argue that the distinction is irrelevant – what matters is that the image looks more detailed. Colours are clearly punchier and more vibrant, too, but without looking overcooked or unnatural. All in all, The One looks every bit the upgrade over its predecessor. There are caveats: there’s only so much you can tell from a demo, and on closer, independent inspection, the performance of the final sets could differ to that of the demonstration sample. And, of course, the price could be higher than expected. In other words, while the picture performance of The One is impressive, we wouldn’t recommend placing an order until we’ve had the set in for a full review. Less impressive than The One’s picture performance demo was the audio comparison. Philips talks a good game about the changes it has made, explaining that its new drivers go at least 40Hz deeper than the previous model, and, sure enough, The One sounds much bassier than the outgoing 7303. It’s more open and spacious, too. The problem is that the bass itself doesn’t appear to be of a terribly high quality, sounding a bit woolly on first listen, and it also rather drowns out and muffles the midrange. During our demo, the sound wasn’t projected into the room effectively, either. Again, the demo was brief and the sound may turn out to be better than it initially seemed once we get our review sample in. While it’s impossible to draw firm conclusions from a brief demo, our first impressions of The One are very good indeed. On the picture front, this appears to be a real step forward and could well be the new benchmark for mid-range TVs. The sound is a bit disappointing, but we always recommend adding a soundbar to a TV anyway. What’s more, Philips will offer a TV with the same picture performance as The One and an improved speaker system. That TV will be called the 7504, and could well be worth checking out if the audio upgrade doesn’t add too much to the price. Either way, Philips deserves appreciation for putting some real effort into its more affordable TV models. Rival manufacturers should take note.